Replens Long-Lasting Vaginal Moisturizer provides immediate alleviation of dryness symptoms and helps replenish vaginal moisture. 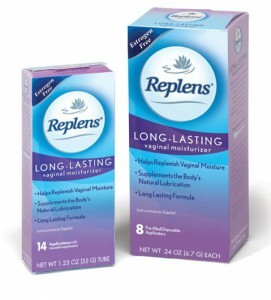 Simply apply Replens a couple times a week to help alleviate the feminine discomfort associated with vaginal dryness. Replens is different from other lotions or lubricants because it contains a patented bio-adhesive ingredient that allows it to attach to dry, compacted cells and deliver continuous moisture until those cells are naturally regenerated (about every 3 days). Replens leaves vaginal tissues hydrated and feeling rejuvenated.